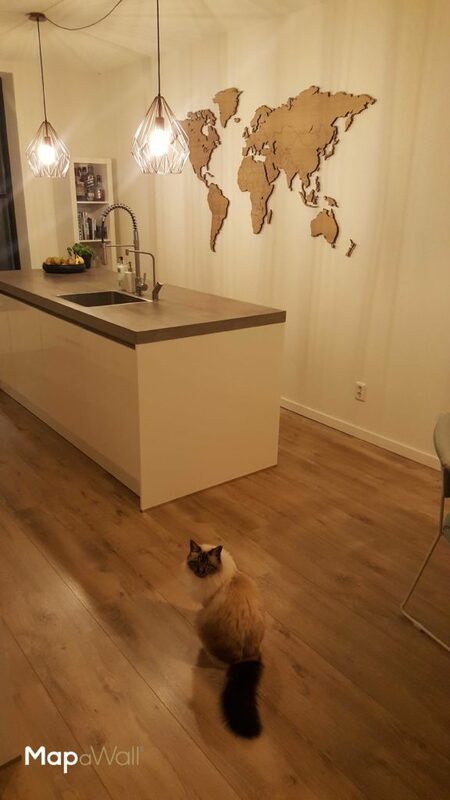 Here is an image of our impressive MapaWall Oak in a customer’s home in Ridderkerk, The Netherlands. 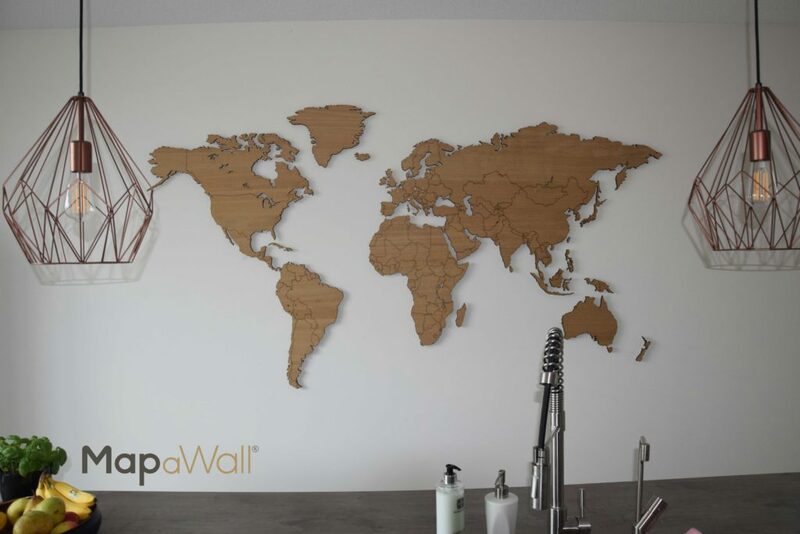 This beautiful wooden map can be seen placed in a breathtaking open plan kitchen space. As you can see, the customer has created a calm space with a lovely ambience that emits relaxation. This room has moved away from the harsh tones and industrial look usually associated with a kitchen space. Instead the customer has chosen to construct an environment that is ideal for our MapaWall Oak. 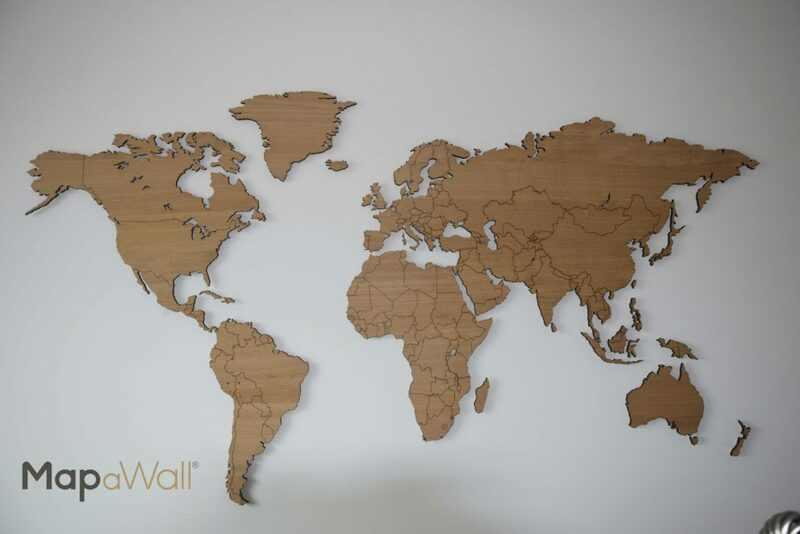 They have established the perfect location for this wooden map, on an expansive and spacious wall. 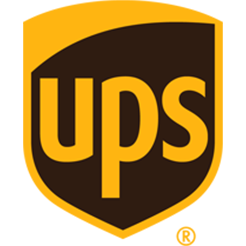 It has been placed centrally above the counter to achieve a symmetrical effect. Our MapaWall Oak is a light colored wood. It has subtle tones of cream, light brown, almond and caramel to produce a dreamy overall color. Oak typically is known for its straight grain with the occasional twist or curl that gives its distinctive look and feel. The customer has a clear likeness for this pleasing characteristic and has chosen to utilize it on their kitchen surfaces as well on their vast flooring. It is possible to see this unique, straight grain beautifully presented on this wooden flooring. The grain helps to exaggerate the length of the room by forming an elongating effect. The customer has replicated this feeling of length by matching the grain to that of the MapaWall Oak. The customer has gone with a calming, neutral color palette with the use of understated, creams, whites and browns. This room has been decorated with exquisite crystal lamp shades that greatly help in achieving this ambient, relaxed sensation. The decision to pair this color with chrome decor adds to the subtlety and grace of this space. A perfect fit for our enchanting, light MapaWall Oak.